Imagine having a fool-proof method to cook your favorite meats and dishes while you kick back and relax on the couch. No, you’re not dreaming. That device exists — and it’s called a slow cooker. If you’ve ever heard somebody raving about their slow cooker, rest assured they really are all they’re hyped up to be. They save you valuable time in the kitchen so that you can focus on what truly matters — eating! They’re also hassle-free, which makes them the perfect kitchen accessory for even the most beginner-level chefs. Still not convinced? One of the more significant perks of these appliances is their ability to save money by allowing you to make your own delicious home-cooked meals — what’s not to love? Obviously, the best road to having a slow cooker you will love for cooking everything, including easy sausage recipes, is to find the one that works best for your needs. Slow cookers, like all appliances, come in a variety of shapes and sizes. Do yourself a favor and take some time to investigate the slow cooker market before purchasing. The slow cooker you invest in should offer the size you need for you and your family, as well as stellar reviews to back up the manufacturer’s claims. Additionally, be certain that you get a slow cooker that offers easy-as-pie cleaning. The last thing you want to do is make a fast meal only to spend all your time keeping your new appliance tidy! In general, it’s best to purchase a slow cooker new rather than used. That way you won’t be inheriting someone else’s sub-par machine that has a lot of mileage. Don’t peek. You may be tempted to crack the lid and keep an eye on your juicy chicken breast as it cooks, but try to keep your anticipation at bay by leaving the lid closed. Keeping the lid shut is an essential part of the cooking process, and allowing the steam to escape could interfere with your meal. Opt for fresh foods. Sometimes, frozen ingredients take longer to cook. As they thaw in a cooker, the cooking process can alter drastically, too. That’s why it’s important to opt for fresh foods, such as Premio’s Italian Sausage — which is made with fresh ingredients and butcher-quality cuts of meat. Never overcrowd. You need a little space every now and then, and your foods do, too. Don’t fill your slow cooker to the brim with your favorite ingredients. As a general rule of thumb, keep your appliance only roughly half full to avoid under-cooking. Explore different settings. Your slow cooker will offer a number of heat settings. For instance, you might see “warm,” “low” and “high.” Depending on the model of slow cooker you have, you may see other settings. When you first start out, explore each one. Read the directions thoroughly so you understand the best ways to use each setting to make sure your easy sausage recipes turn out perfectly. Have a thermometer handy. Planning to cook some meats such as sausage or poultry? Although chances are good that after eight hours in a slow cooker your meat will be done, you should always make sure. Store slow-cooked food properly. You dove headfirst into your sausage chili and now have a ton of wonderful leftovers for tomorrow’s lunch. Instead of waiting, dish up the chili into some refrigerator-safe containers and chill your food immediately. Not sure you’ll eat all that chili within two days? Pop the container in the freezer instead so you can microwave it later. Add dairy products at the end. Does your favorite slow cooker recipe call for adding some milk to thicken the sauce or cheese to add taste and texture? Rather than putting dairy in at the beginning of your slow cooker process, add it at the end. Why? When cooked too hot, dairy can break down into its components, changing the flavor of the meal. Yes, it will still be yummy, but it may not taste exactly as you expect. Cook pasta last or on the stove-top. Pasta and rice tend to get mushy if they are kept in a slow cooker for longer than 30 to 60 minutes. Instead of allowing them to break down, boil some water and cook up the perfect amount of rice or noodles to accompany your slow cooker meal. That way, it will have the perfect density to support real Italian sausage gumbo, stew or goulash! You can set it and forget it, allowing you to spend your time on more important things. You can have a home-cooked, tasty meal every night for your family. You can stop spending too much money on expensive takeout. You can produce large meals that are easy to freeze for later. You can be sure that you use up all those extra ingredients in your refrigerator and pantry. No food should go to waste! So you’ve mastered your slow cooker, but now you’re left with one fundamental question — what do I eat? Whether you’re a fan of stews or meats, you can never go wrong with our easy sausage recipes for dinner, which provide you with the juicy flavor and tasty additions both you and your family desire. Crockpot Lasagna — Use your favorite Premio Sausage along with the traditional lasagna ingredients for a super easy take on this favorite dish. Slow Cooker Spicy Sausage and Lentil Soup — Just combine creamy chicken broth with Premio Hot Italian Sausage, fresh veggies and lentils, and you’ve got dinner ready in a snap. Easy Sausage Stew — Cold outside? Try this classic dish with a little extra pizzazz from our Premio Italian Sausage with tomato, garlic and rosemary. 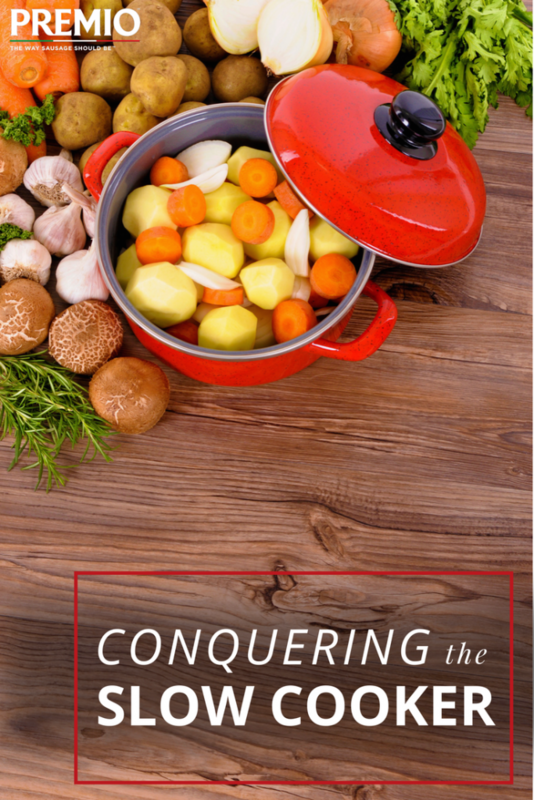 When it comes to slow cookers, your possibilities are seemingly endless. Whether you’re in the mood for a creamy soup or hearty stew, remember to include Premio Sausage in every dish. What are your favorite slow cooker meals? Let us know in the comments below!